Many internet users employ simple tricks when they want to find some interesting software or computer game. They type the desired program’s name into the search bar, add the word “download” and hit enter. In most cases, the first few results from the search engine usually belong to free download servers. I recently followed some of these links to visit the web pages hidden behind the words “free download” and was amazed at the techniques used to manipulate users. It’s not only the advertising pages you are forced to visit the instant you load the page, but if you are not careful, various sorts of malware or adware are installed to your computer without your notice. Let’s take a closer look at the shady practices you can expect from free download servers. Download what? They really want you to look at the advertising! But don’t think you're done, because the advertising nightmare is not over. On the last screenshot from this page you see the final download button. There is however another catch. Not surprised, are you? Read the last line beside the checkbox carefully. This means that when you click the download button, it will start a download, just not your file. It will download only their manager, where you will install more adware directly to your computer. Oh goody. TIP: Every time you start a file download from the internet, check if it has the right name and extension. When I inspected similar sites to this one, many executable files popped up, even if I was looking for a RAR package. They are disguised as Archivers, Codec packages, or Download managers and had one thing in common – they try to confuse the user with clever sentences and hidden check boxes. I tested several dozen of these fake download buttons and not surprisingly, acquired a few new executable files. The download buttons redirected me to pages containing a registration for a game, an online casino, all sorts of medical products, and once, a chance to win a free iPhone in exchange for my mobile phone number. I did not gave them my phone number because the only thing I could win would be SMS advertisements or an attack on my privacy from some sort of mobile-oriented malware. One big download button redirected me to page where an automatic download started. The page stated that this is an installer for a well-known archiver. 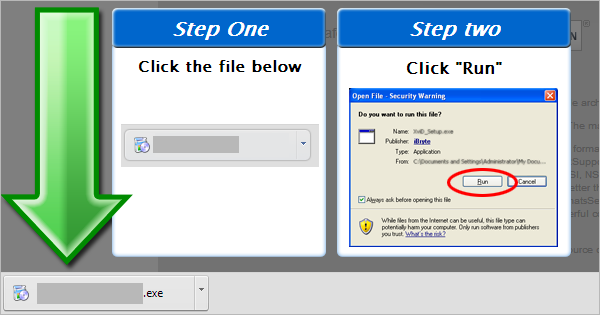 As this screenshot shows, there is simple tutorial on the page which shows the user how to execute the file without thinking further. But what this tutorial really shows is how to ignore a security warning and let a potentially dangerous application install onto your computer! This installer had other applications bundled, so when I started to install it, the first screen offered me a toolbar for my internet browser. There are only a few things less useful than a toolbar, because all its functions are already available in every internet browser. On the next screenshot you can see what happens if you don’t want to install this toolbar. Another dialog designed to discourage you from skipping the installation by implying that this will abort the whole install. If you think you want a toolbar installed, I suggest you read the license agreement which often offers very amusing content. In section 4. it states that the toolbar is not considered secure, and I can tell you why! Because the only thing that matters to the author of applications like this one is profit. At the end of the installation, where I choose only to install the packer and nothing else, all the files listed in the last screenshot were downloaded to my computer and executed. None of these files were removed after installation and some of them are set to start automatically after the computer starts. There is also a proxy server enabled and updated in my windows registry and program which I did not agree to install. Except for 7z and sweetim, there was not even a notice about the other programs. I don’t think this is the way a normal application installer should work. Many free download servers are active on the internet today, but none of them give you anything actually for free. You will pay for them with your personal data or computing time when malware attacks. You should always bear in mind that there are just a few really free things on the internet, fortunately avast! Free Antivirus is one you can count on.